Island crisis could fuel more Puerto Rican migration to U.S. The signs of Puerto Rico’s acute socioeconomic crisis are everywhere. The Island’s economy is expected to decline by 5.5 percent this year. Local consumer debt reached almost 23 billion U.S. dollars in 2008. The unemployment rate was 16.5 percent in July 2009. Since 1996, 45,000 manufacturing jobs have been eliminated. For the first time in years, the poverty rate increased during the current decade. The massive layoffs by the Commonwealth government have caused public dismay. Many people are extremely worried about keeping their jobs and paying their bills, taxes, insurance, and mortgages. One of the traditional strategies in the face of economic difficulties in Puerto Rico has been emigration. An increasing number of Puerto Ricans is seriously considering that alternative, despite the recession of the U.S. economy. During the current decade, at least one-quarter of a million Puerto Ricans has moved to the continental United States. According to the Puerto Rico Community Survey, nearly 428,000 residents of the Island relocated to the mainland, while about 224,000 returned from abroad between the years 2000 and 2007. According to the Puerto Rico Ports Authority, the net passenger movement to the United States totaled around 297,200 persons between 2000 and 2009. In 2008, 51.6 percent of all persons of Puerto Rican origin lived outside the Island. Aside from the massive resurgence of the Puerto Rican exodus, the latest census statistics confirm the migrants’ changing settlement patterns. In 2008, the state of Florida had the second largest number of Puerto Rican residents (744.4 thousand), after New York (1.1 million). Between the years 2000 and 2007, five of the ten leading destinations of Puerto Rican migrants were in Florida: Orange, Miami-Dade, Broward, Hillsborough, and Osceola counties. During the same period, 38,257 residents of the Island resettled in Orange County, the center of the Orlando metropolitan area, which has displaced Philadelphia and Chicago as the second concentration for Puerto Ricans in the U.S. mainland. Other popular destinations for the migrants are Hamden County, Massachusetts; Philadelphia; the Bronx in New York; Hartford and New Haven, Connecticut. On average, contemporary Puerto Rican migrants are younger, better educated, more skilled, and more likely to be bilingual than the Island’s population. Still, it is exaggerated to characterize the entire new migrant flow as a “brain drain,” since the bulk of the migrants has a secondary education and a blue-collar or service job. At the same time, a growing proportion consists of highly qualified professionals, including medical doctors, engineers, nurses, and teachers. Among the main motivations for this continuous exodus are the gaps in wages, working conditions, and opportunities for professional development on the Island and in the United States. Furthermore, many migrants are seeking a better “quality of life,” referring especially to public services, housing costs, safety, and tranquility. Finally, the most recent census estimates allow a comparison between the living conditions of Puerto Ricans on and off the Island. In 2008, Puerto Rico’s unemployment rate was 14.8 percent, compared to 10 percent for Puerto Ricans in the United States, 9.3 percent in Florida, and 10.4 percent in Orlando. The median income for Puerto Rican households on the Island ($18,190) was less than half than in the United States ($39,039), Florida ($41,892), and Orlando ($39,778). In turn, Puerto Rico’s poverty rate (45 percent) was much higher than for Puerto Ricans in the United States (24 percent), Florida (17.5 percent), and Orlando (16.2 percent). Given such wide discrepancies in employment opportunities, income levels, and other economic indicators, the new migrant wave will probably persist, until living conditions on the Island improve substantially. Let’s hope that happens soon. Jorge Duany is Professor of Anthropology at the University of Puerto Rico, Río Piedras. He is currently the Wilbur Marvin Visiting Scholar at the David Rockefeller Center for Latin American Studies at Harvard University. He earned his Ph.D. in Latin American Studies, with a concentration in anthropology, at the University of California, Berkeley. He also holds an M.A. in Social Sciences from the University of Chicago and a B.A. in Psychology from Columbia University. He has published extensively on Caribbean migration, ethnicity, race, nationalism, and transnationalism. His most recent coedited book is “How the United States Racializes Latinos: White Hegemony and Its Consequences” (2009). I cannot understand the brouhaha in some circles on the left around Sonia Sotomayor’s description of her parents as “immigrants”. And I certainly cannot believe that people on the right are so petty as to not call her the first “Hipanic”/Latina to the Supreme Court by calling Benjamin Cardozo, a man of Portuguese ascendancy, “Hipanic”. Many of my readers know how I feel about the word “Hispanic”, so let me put this to rest: The census document quoted in my infamous article expressely describes the word “Hipanic” as used by the agency to describe Puerto Rican and other Americans of Latin American origins who did fall into the category of Mexicans. Citizens of Spaniards and Portuguese backgrounds were not “Hipanics” because they were Europeans. Same with Spanish and Portuguese -speaking African and Asian immigrants. So people, let’s lay this one to rest: Benjamin Cardozo is not a Hispanic or Latino. Period. Yet let me get to the issue of whether Puerto Ricans can be called immigrants. I am appalled that in some mailing lists used by liberal bloggers there’s a rush to accuse right-wing commentators and even Sonia Sotomayor herself for calling her parents “Puerto Rican immigrants”. The logic behind this? That since Puerto Rico is a colony of the United States where Puerto Ricans have US citizenship, that this invalidates calling Puerto Rico a “foreign country” and it’s people as “immigrants to the United States”. The fight is to accuse the right of smearing her parents with the word immigrants because Puerto Ricans, allegedly, have no immigrant experience. And what baffles me most is that the people pushing this line of thinking are “immigration activists” for whom it is a nuisance to fit Puerto Ricans in their “comprehensive immigration reform” narrative. In the past few years all the talk of immigration laws has been about how it is used to attack Mexicans and other mostly Central Americans. Yet the reality is very different. You may want to call Puerto Ricans “migrants” because they we live in a US territory, but the peculiar political status of Puerto Rico as a pseudo-“Free Associated State” (aka: Commonwealth) has made many define Puerto Rican identity in the United States as one of immigrants with no immigrant status. Rene Marques’ La Carreta (the Oxcart) became in the middle of the 20th century “the play” that captured this migrant/immigrant ethos of the Puerto Rican experience. In the play, a family of sugar-cane field workers sets out of the plantation looking for a better life. They not only end in a slum when in San Juan, but their penury there pushes them to New York City, where they only find ruin, despair and a death that returns them to the land they had previously fled from. The play became an allegory for Puerto Rican identity because it describes the Puerto Rican experience as one that is fundamentally migrant inside the island and immigrant when in the United States. Rene Marques’ neo-realist theater was cemented in history and in this case, in the historical context of Puerto Ricans being a nation of immigrants. 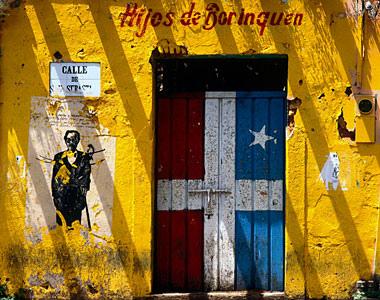 Many of the boricuas of the 20th century were descendants of immigrants themselves. Spain had given to many Europeans indentured labor contracts for settling in Puerto Rico back in the 19th Century. Through these contracts the King of Spain leased the land to whomever wanted to work it and buy it back with their revenues. Many non-Spanish speaking Spaniards ended in the country, especially Catalanes, Basques, Canarinos and Gallegos along with other European groups like Italians, Irish, along with Roma from many Eastern European countries. Even under Spanish rule Central land South Native Americans were imported as the preferred group of household servants for the Spanish elite. Even though the task of defining what it was to be a Puerto Rican had been taken up by many artists and thinkers by the time Puerto Rico was invaded by the United States in 1898, the Puerto Rican criollo movement (aka, Spanish/European identified Puerto Ricans) was stronger and more influential than their nationalist counterparts and when compared to the separatist nationalist movement in Cuba and at the other corner of the fallen Spanish colonial world, the Philippines. It explains in many ways why the United States furiously aligned themselves to these criollistas and unleashed a wave of violence against the mostly brown and black nationalist movement in Puerto Rico; even going as far as torturing the leader of the nationalist movement, Don Pedro Albizu Campos, by using him for radiation experiments. We, the people of Puerto Rico, in order to organize ourselves politically on a fully democratic basis, to promote the general welfare, and to secure for ourselves and our posterity the complete enjoyment of human rights, placing our trust in Almighty God, do ordain and establish this Constitution for the commonwealth which, in the exercise of our natural rights, we now create within our union with the United States of America. We consider as determining factors in our life our citizenship of the United States of America and our aspiration continually to enrich our democratic heritage in the individual and collective enjoyment of its rights and privileges; our loyalty to the principles of the Federal Constitution; the co-existence in Puerto Rico of the two great cultures of the American Hemisphere; our fervor for education; our faith in justice; our devotion to the courageous, industrious, and peaceful way of life; our fidelity to individual human values above and beyond social position, racial differences, and economic interests; and our hope for a better world based on these principles. I want to stop here a moment because there are no accidents with this preamble: At no point does it say that Puerto Ricans take an oath of loyalty to the United States. At no point does it say that Puerto Rico is part of the United States. On the contrary, this document goes through great pains in defining Puerto Rico as a separate nation and a separate country without acknowledging Puerto Ricans’ right to self-determination, autonomy and sovereignty. On the contrary, the nation of Puerto Rico and Puerto Ricans aspire continually to enrich our democratic heritage in the individual and collective enjoyment of of the rights and privileges that come with having US citizenship. Can you understand why constitutionally many Puerto Ricans make the case that we are a nation recognized by the United States and thus a separate, albeit not foreign country? And it’s this contradiction that defines the Puerto Rico experience in the United States. An experience that even though has been defined by US citizenship since 1917 (Puerto Ricans who emigrated between 1898 and 1917 to the US actually had PR passports), has always been one of emigration to the United States not just migration from the island. So please, stop wasting time in debating whether it is OK to call Puerto Ricans immigrants. We are. Get over it. Now go and get Sonia Sotomayor confirmed to the Supreme Court. Further Reading : Puerto Rico: A Colonial Experiment by Raymond Carr is an excellent resource and place to start reading about the development of the Puerto Rican commonwealth. So is Jose Trias Monge’s Puerto Rico: The Trials of the Oldest Colony in the World and Puerto Rico: A Political and Cultural History by Arturo Morales Carrion. NEW YORK — Puerto Rico Governor Anibal Acevedo-Vila presided over the official opening of the Commonwealth’s new offices in New York City on Wednesday. Located at 135 West 50th Street in Midtown Manhattan, the new facility brings for the first time, Puerto Rico’s four economic development and promotional agencies under one roof: The Puerto Rico Industrial Development Company, the Puerto Rico Tourism Company, Rums of Puerto Rico and the Government Development Bank. “The Commonwealth ofPuerto Rico has long maintained a visible presence here in New York, the world’s financial, business and media capital, and the cultural and economic ties between the Island and New York are as strong as ever. In addition to a suite of offices on 22nd floor, the Puerto Rico Tourism Company will soon open a storefront location on the building’s ground floor. According to Terestella Gonzalez Denton, Executive Director of the Tourism Company, the visibility will be especially valuable now, when record breaking numbers of overseas tourists, drawn by the weak American dollar, are flocking toNew York City. Despite the downturn in the U.S. economy, Puerto Rico’s tourism program is thriving. The Island drew more than 5 million visitors in 2007, up nearly 100,000 from the year before. And, with 21 new hotel properties in the pipeline, the Puerto Rico Tourism Company is well on its way to meeting its goal of 14,000 new hotel rooms by 2011, a doubling of the existing inventory. On the industrial development front, Boris Jaskille, Executive Director of the Puerto Rico Industrial Development Company (PRIDCO), reports more than 22 “high impact” projects over the 18 months, accounting for $2 billion in capital investment and 5,000 direct new jobs. These include nearly a billion dollars worth of new investment by life sciences companies such as Pall Life Sciences, St. Jude Medical and Abraxis Biosciences, as well as several millions of dollars in added investment by aerospace engineering companies, including Honeywell and Pratt & Whitney, who are taking advantage of the large pool of highly skilled engineers on the Island. The new Incentives Act for Puerto Rico, which allows for tax incentives and added benefits to businesses establishing their operations on the Island, has been recently revamped in a paramount team effort of both the public and private sectors, to position Puerto Rico as the location of choice for foreign direct investment. “We’re currently sharing these new tools and provisions of the PR Incentives Act with potential investors and site selectors seeking highly competitive tax rates along with Puerto Rico’s world-class skilled workforce and unparalleled value proposition. We are also addressing global challenges and reducing energy costs. This strategic plan will undoubtedly position the Island as a front-runner in investment promotion”, said Jaskille. Puerto Rico: Nation, Commonwealth or State?